A trio of patent applications published by the U.S. Patent and Trademark Office on Thursday reveal Apple is conducting in-depth research into quantum dot-enhanced electronic device displays. 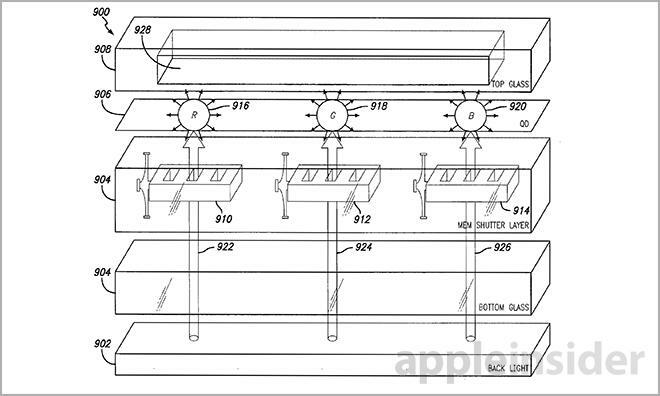 Taken together, Apple's three patent filings describe an advanced system in which quantum dots are disposed across a device display to offer richer colors, better off-axis viewing and overall better performance when compared to a conventional LCD screen. 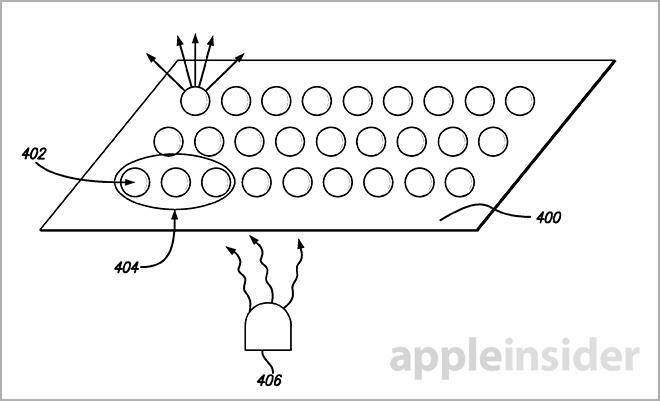 Apple was first discovered to be working on quantum dot-enhanced displays when the USPTO published a patent application in December, which outlined the use of a dichroic filter to more accurately control luminance. Thursday's documents are titled "MEMS shutter control for a display utilizing quantum dots," "Light mixture for a display using quantum dots" and "Backlight dimming control for a display utilizing quantum dots." Each invention details a piece of a larger mechanism that may one day be implemented in products like the iPhone or iPad as a way to enhance color accuracy without greatly impacting cost. 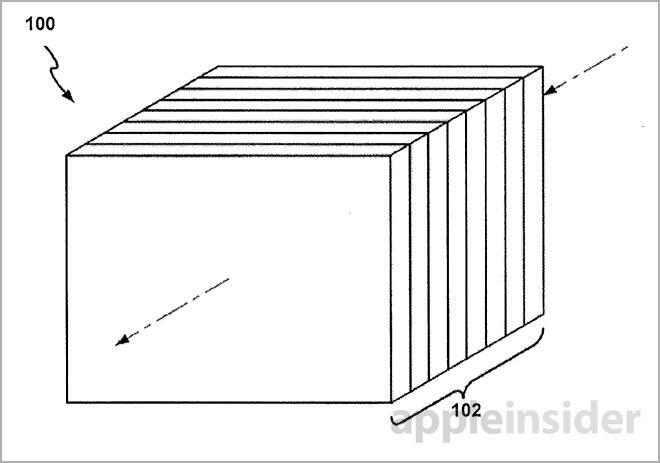 Perhaps the most interesting of the three is Apple's microelectromechanical systems (MEMS) shutter control patent. LCD displays are typically constructed with a backlight layer that sends light through a liquid crystal layer, which is responsible for controlling brightness at individual pixels to produce an image. The backlight is usually composed of LEDs coated with a phosphor to give off a white light that subsequently moves through the liquid crystal layer to produce color. Color gamut refers to the subset of colors the display is able to create and is a function of the spectral width of produced red, green and blue light. As noted in the patent, one way to enhance color gamut is to replace the LED phosphor with quantum dots, or nanocrystals made from a semiconductor material that exhibits special quantum mechanical characteristics. QDs emit light isotropically during excitation from absorbed energy like light. Especially advantageous to display makers are QDs' light-emitting properties, which are defined by size and shape. This means the dots can be manufactured to emit very narrow spectrums of light that in turn produce wide color gamuts. 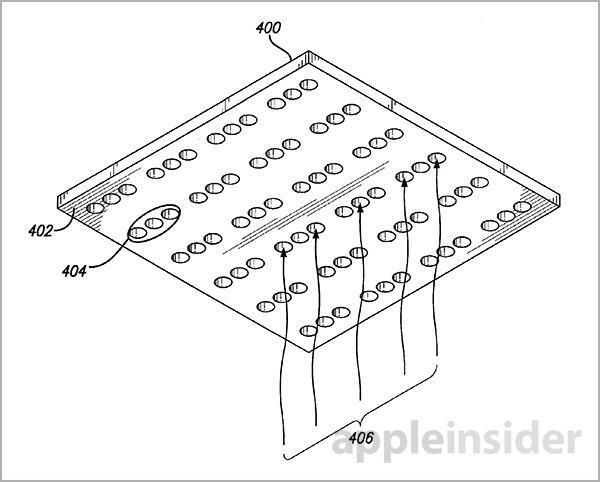 Apple points out, however, that fabricating a backlight structure with integrated QDs would add unwanted complexity to the system considering the dots' light-emitting properties. At the same time, integrating them within the liquid crystal layer is also problematic. Liquid crystal mechanisms require light to be polarized in order to control color and brightness, and QDs emit un-polarized light. To successfully position the QDs outside of the backlight structure, Apple proposes the complete replacement of the liquid crystal layer with a MEMS shutter control layer. By performing the swap, the display is able to maintain accurate color provided by QDs while at the same time keeping the backlight architecture largely untouched. In one embodiment, the MEMS mechanism is composed of a conductive line, or trace, attached to a shutter. An energy source operably connected to a display controller can provide current to the conductive line, which causes it to become attracted to a static line located in such a way that the optical shutter is pulled closed. The stackup is composed of a backlight, glass panel, MEMS shutter, QD layer and cover glass. Light moves from the backlight through the MEMS shutter and into the QD layer, which in turn emits a specific light in the spectrum. Emitted light can be mixed to reproduce a large color gamut and fine tuned to display images. Moving to the "Light mixture" document, Apple provides a completely different application of QDs that implements the sheet within a backlight stackup. As mentioned in the above filing, such integration causes issues stemming from the isotropic properties of the QDs and a backlight's emitted light. 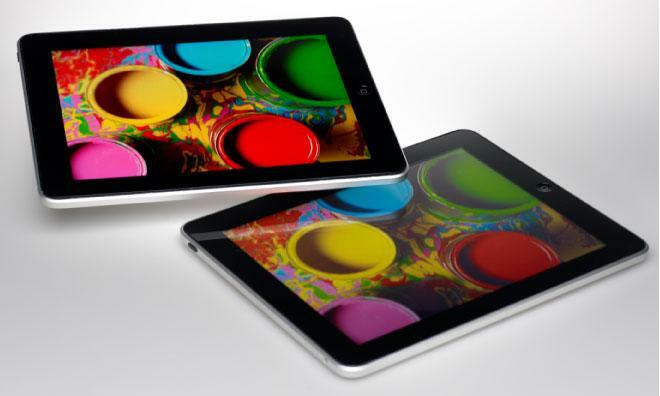 Problems include non-uniform brightness, color mixing and inaccurate color representation. In this model, a liquid crystal layer is disposed over a backlight stackup. The backlight may be direct or edge-type, but instead of being coated with a phosphor layer tuned to output white light, a QD sheet is used. 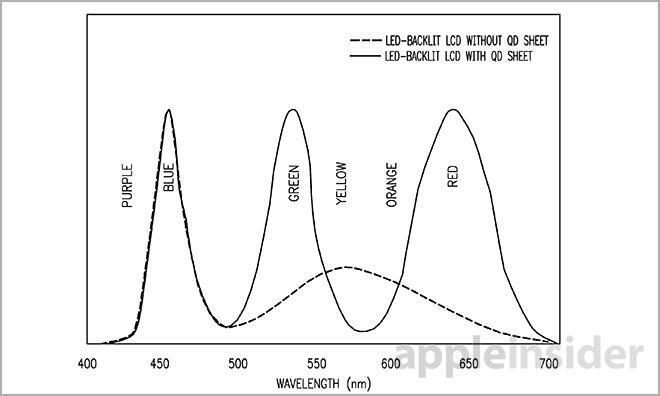 For example, a blue LED —used for its naturally narrow spectrum —or UV light can excite QDs, which emit pure color light to the liquid crystal layer. Problems occur when a QD sheet is too close or too far from a light source, however. The dots may move from excessive heat or the light mix may be poor due to refraction and uneven intensity. To overcome these issues, the patent goes into great detail regarding the use of prisms, diffusers and light guides. With the right combination, a backlight sub-stack may be produced that is not only more accurate, but thinner than existing modules. Finally, Apple's "Backlight dimming" invention takes the previous QD-enhanced backlight system and fine tunes it to correct for LED color shift. In practice, the QD backlight may have dots arranged in RGB groups so that the light, when mixed, produces a white output. Other embodiments call for a blue LED and groups of red and green QDs. In this example, the blue light mixes with emitted red and green light from the QDs to produce white light. As with common LCD panels, the backlight's brightness may be altered through a reduction in supplied current to affect output intensity. However, in a QD backlight stackup such a change would cause a shift in wavelength of light emitted by the blue LED. By tuning pulse width modulation, the luminance value of light output by the LED can be controlled to within certain parameters, thus minimizing wavelength shift. For example, luminance can be monitored for a set threshold value. If that threshold is breached, a display controller can adapt the duty cycle and drive current to maintain luminance, but keep wavelength shift to a minimum. At this point it is unknown if Apple will use its QD tech in near-future product applications, though the tech is already being used in other devices like televisions. Apple's MEMS shutter control and light mixture patent applications credit Shawn R. Gettemy, Jean-Pierre S. Guillou and David A. Doyle as its inventors. The backlight dimming control patent credits Chenhua You and Jean-Jacques P. Drolet as its inventors, while all three applications were filed on Oct. 31, 2012.